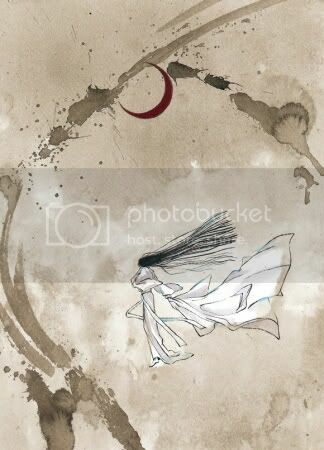 CLAMP use traditional brush strokes and watercolours, departing from their usual style, to bring us this collection of tragically beautiful tales. Set in an ancient fantasy world, every page is charged with emotion, melancholy scenery and a sense of foreboding. 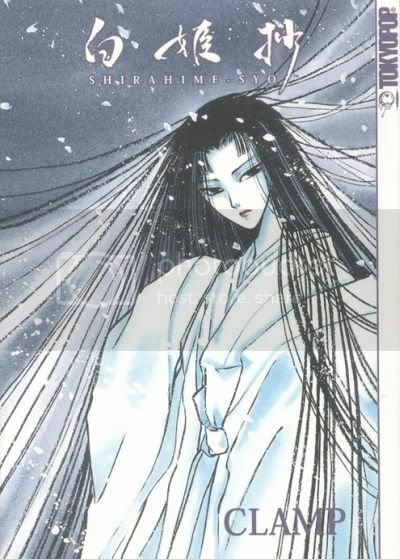 Shirahime-Syo (literally meaning Snow Princess) is a collection of winter tales linked by the myths surrounding the Snow Princess. The epilogue and prologue deal with the Princess herself while the three tales describe tragedies befalling people in the snow. â€˜On Wolf Mountainâ€™ is about a girl Fubuki. Alone in a blizzard on a vengeance hunt for the wolf she believes killed her father, she is attacked by a pack of dogs. When events occur which bring her assumptions into question a strong bond develops between girl and wolf, but can it last? In â€˜The Ice Flowerâ€™, Kaya promises her lover she will wait for him by the lakeside never changing until he returns from battle. Will she wait thirty years? Finally, in â€˜Hiyoku no Toriâ€™ (‘Happily Married Couple’), a warrior lost in th snow catches sight of a pair of herons and kills one out of jealousy. He feels so alone without his lover Yukino (yuki means snow), but will he ever escape the snowy mountains and return home? Out of context these plots may sound uninspring, but donâ€™t be put off by that, it isnâ€™t the plot that makes these so wonderful but the surprisingly tragic twist to every tale. The plot and dialogue may be simple, but it is effective and poetic enough to convey the emotions of the characters. What really makes this manga stand out is the artwork. The first eight pages are in colour showing the pale ghostly image of the Snow Princess and her blood red lips, which gives you a better idea how she really looks later on. Emotions are often expressed by long hair, which grows to incredible lengths and flows beautifully in the wind. You get the feeling that the placement of every hair has been carefully drawn to emphasize what the character is feeling, from Fubukiâ€™s desire for revenge to the sadness of the heron spirit. Their faces have unusually long and delicate features making even the happiest moments seem melancholic. Entire pages are used to show vast backgrounds emphasizing the snow at the most tragic and mysterious points of the story. 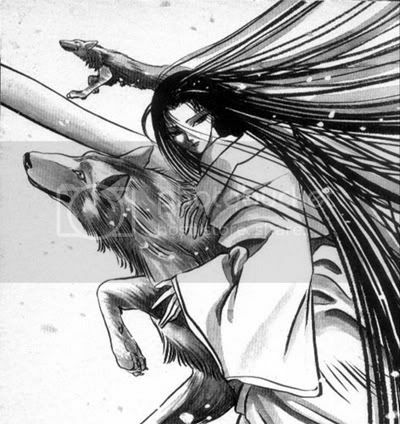 The *spoiler* death of Inuki, and the girl under the icy lake are among my favourite of these images. Even the sound effects appear to be blown about by the storm, and the panels are carefully composed to emphasize the presence and severity of the snow. There are some minor drawbacks. Some of the female characters look too similar, Yukino is only distinguishable from Kaya by her slightly childish features and the lost warrior looks overly feminine to me. Sometimes the Snow Princess features so little in the stories it is difficult to justify the title, and it would have been lovely to see a tragic tale of the Snow Princess herself to round things off a bit. This may be depressing, but it is also well worth a reread. I picked it up two years ago and have looked through it a handful of times since because I remember feeling drawn in and involved – despite the inevitable tragedies. I recommend Shirahime-Syo to anyone who wants to read something a little different with powerful themes of love, vengeance, hope, forgiveness and loneliness: this is an anti-happily ever after manga, you may need some tissues!